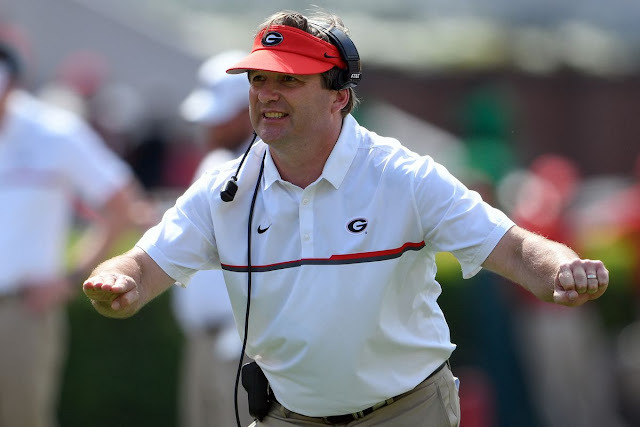 Shirts With Random Triangles: Kirby Smart's "Lockdown Georgia" tweet is the Most Awkward Sports Tweet of the Day. Kirby Smart's "Lockdown Georgia" tweet is the Most Awkward Sports Tweet of the Day. Kirby Smart. Image via Dawg Sports. Congratulations to Georgia head coach Kirby Smart for what has to be the most awkward sports tweet of the day. Smart's tweet in theory was about no. 1 overall high school prospect for 2018 Justin Fields committing to Georgia, but the use of use of an image saying "Lockdown Georgia" is somewhat ironic coming after news that Bulldog linebacker Nantrez Patrick was arrested Thursday night on marijuana-related misdemeanor charges. Just remember to think before tweeting, sports fans.